Corradi, di Lelio, Sinimberghi, Gobbi, Tajo; Morelli; Costa, dir. Chorus and Ballet of the Teatro dell’ Opera of Rome; Orchestra of RAI. Gina Lollobrigida is in the chorus. In Italian, no subtitles. (1947) 80m. B&W. 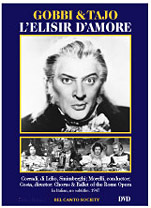 At last this enchanting film reproduced at the correct speed and pitch! This is an affectionate, warm-hearted, endearing Elisir, beautifully photographed with lovely outdoor scenes. If you know Gino Sinimberghi only as the actor who lip-synchs to the voice of Galliano Masini in Forza , you’re in for an agreeable surprise. Alvaro would have been too heavy for his voice, but Nemorino suits it to perfection. He sings sweetly but without crooning, although with real forward placement and a weak, constricted F at the passaggio. When he does use mezza voce, the result is beautiful and effective. His voice has body, also metal on high notes. Heard here in her best role, Corradi is at times adorable, at others catty, always feminine. Unlike others, she makes you feel that at the end Adina really does care for Nemorino. Corradi and the comprimarias have that, for me, beguiling voce infantile (a “white,” childlike sound). Prior to Callas and Tebaldi, some sopranos used the voce infantile to suggest innocence and purity. Sopranos today by and large sound mature and charmless. As Belcore, Gobbi surprises with still another of his facets: the ability to sing florid music accurately and effortlessly–a requirement seldom found elsewhere in what one today thinks of as his repertory. He caps the cadenza to his cavatina with a ringing high G. Belcore was the role of Gobbi’s Scala debut, in 1942. In 1952 he recorded the role for HMV (di Lelio was the Giannetta). His Belcore manages to be both dashing and good natured. You’d think his Scarpia would order fake bullets!